Every December I reread a Christmas card Husband and I received in 2009 from Aunt Doris and Uncle Hugh. The front reads ‘The older I get, the more I love Christmas’ and inside a poem begins with these words: The older I get the simpler my holiday preparations become, the closer I feel to old friends as I write my Christmas cards, the more fondly I remember Christmases past. To give credit to the poet I googled the beginning lines and found that same card is available from Walter Drake, but no credit is given to the writer. The words inspire me to step back, away from the hustle and bustle of Christmas, to appreciate Christmas moments, past and present. Our Christmas tree is a memory tree. Each ornament tells a story. I love the plastic Santa astride a white horse that hung on my family’s tree in the 1950s. 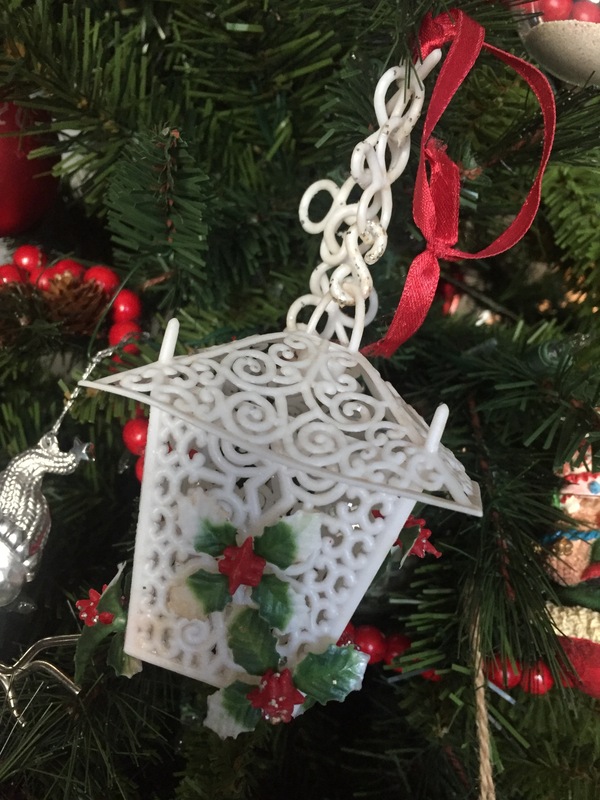 I cherish a plastic lantern, with a sprig of plastic holly, that was tied with a red bow onto a big white box Husband gave me in 1968. Inside that big box were smaller boxes and inside the smallest box was my engagement ring. I treasure the paper ornaments that Son and Daughter made in kindergarten. I hang many teacher ornaments that students gave me through the years. I remember a 6th grade girl handing me a wrapped box and saying, “Mom said you better like these. They cost a lot of money.” Now, thirty something years later, I love those birds more than the day I opened her gift. Last week two Grands, ages 6 and 8, wore their mother’s red dresses and sang in their school Christmas program. As Elaine and Ruth sang Away in a Manger with their classmates, half my heart was in the past when Daughter wore those dresses. She was seven and a second grader when she wore one and sang Silver Bells at a Northeast Elementary School program. As I drove Ruth and ten-year-old Lou across town a few days ago, they laughed at the music on my Christmas CD. “That’s sounds so old-timey,” one said and burst into a jazzed up version of Joy to World. I turned off the recorded music and we sang. I joined them in White Christmas and We Wish You a Merry Christmas. And my Grands laughed because I sang off key. There’s no other time of the year that friends and acquaintances greet each other with such enthusiasm. We hold hugs a little longer. Shout Merry Christmas. Smile bigger. And there’s no other time that I enjoy opening mail more. I love Christmas cards. Greetings from friends and family, from across town and across oceans. I look forward to Christmas Eve candlelight service. The tradition of worshipping and hearing the birth story from the book of Luke and holding a single lit candle while singing Silent Night. Celebrating the miracle of Christmas. The older I get, the more I realize Christmas is a matter of the heart.